If you’re a fan of board games, and don’t own an iPad, you’re not really a fan of board games. 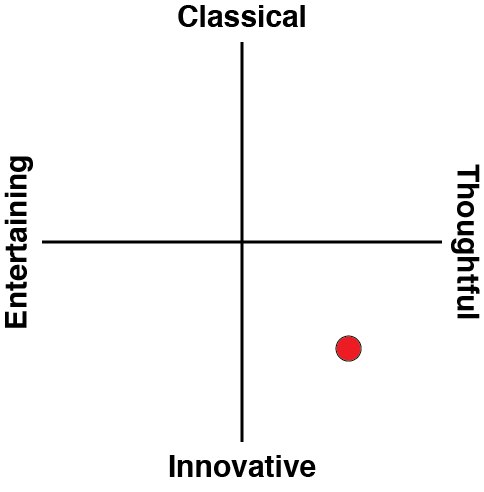 The device is absolutely dominant on the genre, and the shape and size of it make it a natural fit for the kind of interfaces that board games use. Whether it’s Lords of Waterdeep, Agricola, Battlelore, Ticket to Ride or Catan, you’re absolutely spoiled for choice with this genre on that device. 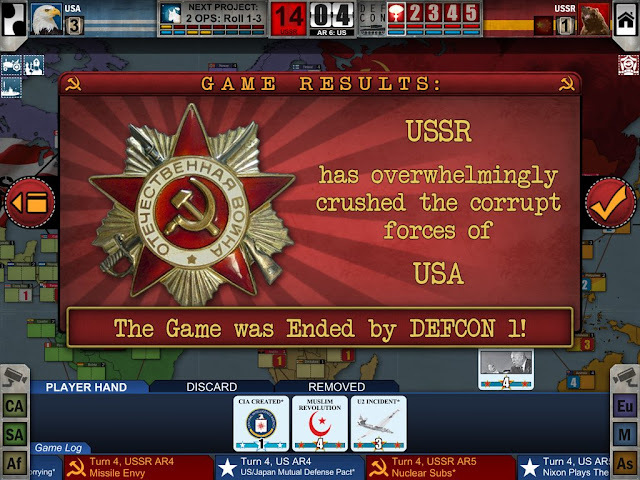 And now there’s Twilight Struggle. Twilight Struggle, for people who are less familiar with board games, is one of the most legendary serious, competitive, board games of all time. An absolute hit for wargame specialist, GMT Games, Twilight Struggle is a little uncommon for the publisher as it’s one of the few games that’s not about military action. Rather, this is a game that’s about the Cold War, and all the political intrigue that came with it. The Cold War, for people who are really unfamiliar with history, was a period of tension between the United States and the USSR, back when it was a giant empire that consumed much of eastern Europe and dominated the politics of Asia. What made is so interesting was that there was no direct war between the two superpowers, for everyone knew that would lead to nuclear missiles being fired, and no one sane wanted that. Instead, the two fought battles of proxy to influence nations and regions towards or away from socialism (or ‘communism’ as the McCarthy nutjobs insisted). Twilight Struggle is about that battle of propaganda and influence. 1) A lot of the cards that you play will have effects that also benefit your opponent, so you’ll need to understand how to minimise the impact of those cards. 2) You’ll need to work fast, because your opponent only needs to get 20 victory points to win, and if you allow them to dominate any region for long, you’ll find their points ratchet up quickly. 3) There’s a DEFCON meter to monitor too. Staging coups brings the world ever closer to nuclear war (and you lose if you let that happen), and it happens quickly, so you need to time your coups well so that they occur at the rare moment of relatively little strife. What ends up happening in the typical game of Twilight Struggle is that each player will find themselves in a situation where there are a lot of conflicting priorities… and very few easy answers to any of them. A full half the cards available will be of equal or greater benefit to the other side than yourself, and while you can convert those cards into attempts to get ahead in the space race, the benefits that brings is minor when compared to the need to get more influence on the table. It doesn’t take long for the tension and balance of the game to land on a razor-find knife edge, and in this Twilight Struggle is an incredible representation on just how terse international politics through the Cold War. And the game only gets more tense as it goes along. At the start the two powers will be fighting for influence predominantly in Europe, the Middle East, and to an extent Asia. But at the mid point of the game that expands out to take in influence skirmishes in Africa, Central America and South America. It becomes incredibly difficult to put a check on your opponent in all regions, though that applies to the opponent as well. By the later stages of the game, a single ill-advised move will cost the entire game. You’ll be pouring over the map, making mental calculations around statistics and numbers, and desperately trying to guess what cards your opponent might hold. You’ll start making deep sacrificed to territories that you control, in order to build up your influence in rivalling regions, and your be carefully building up to incredibly dramatic moments and coups that, if executed well, will give you a real hit of momentum. The way the game is structured is that you’ll need to think many turns in advance, and construct labyrinthine strategies that have plans within plans. 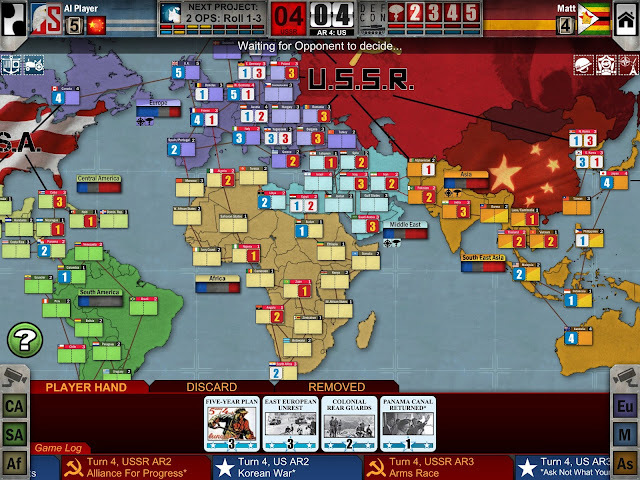 You’ll also spend as much time playing against your opponent’s likely strategies and feints, and this is a risk in itself, as there’s always the potential for your opponent to trick you into wasting a turn by making a play in, say, Africa, when their real goal was to distract you from building influence in Asia. 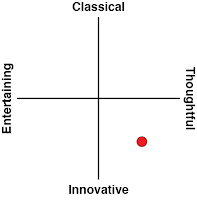 This is a game that mandates concentration, in other words. It’s capped at two players (one as USSR, the other as USA), and it a little like chess in the way it is almost meditative in strategy. You’ll need to be comfortable with turns taking a long time to complete, as both yourself and your opponent calculate through the various permeations, but the upshot to that is a strategy game that rewards clever strategy and tactics, and with random factors having only the lightest impact on results, it’s a game of execution over luck, and is therefore an incredibly fulfilling process in getting better at the game. 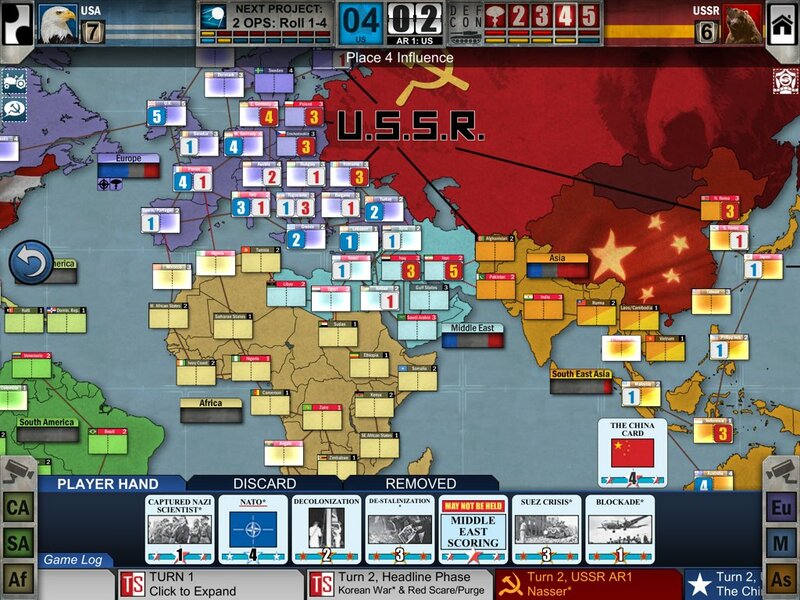 There’s online and local multiplayer available with the iPad adaptation of Twilight Struggle. There’s also a quality AI to test yourself against – especially as you’re learning the ropes. That AI can take a fair time to make its decisions, but I found it fascinating just how complex the AI’s strategies can be. Ultimately you’ll get to a point where you’ll beat it handily, but by then you really ought to be playing humans instead. 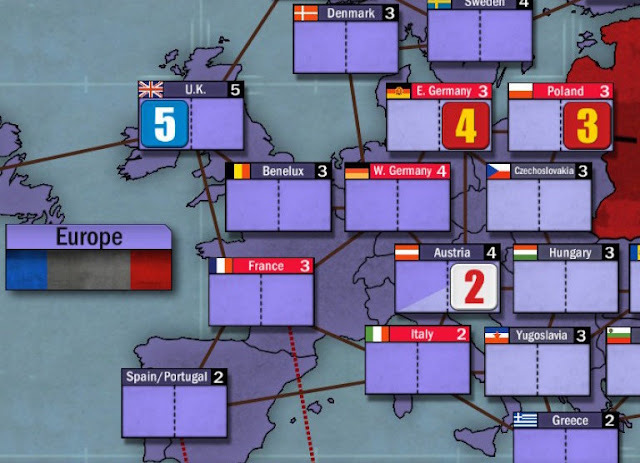 In terms of presentation, GMT board games have always favoured function over flash, and Twilight Struggle is a highly abstracted game of low quality card art and many, many little counters with numbers printed on them. The iPad version presents all this in a nice, clean user interface, though the aesthetic is still as cold as the Cold War itself. However, this game has a superb soundtrack, complete with Cold War quotes, which really give it an atmospheric edge. There is only two other board games I want to see digitised now, and both of them are classics and unlikely to happen any time soon (Tales of the Arabian Nights and War and Peace). Otherwise, with Twilight Struggle, we now have the greatest wargame ever designed on our iPads. 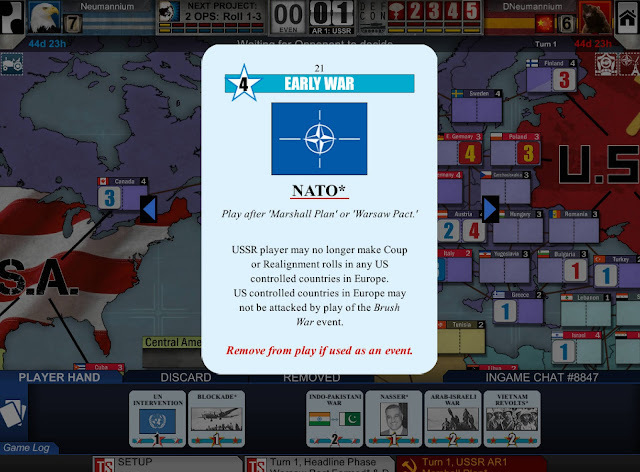 Yes, it’s ironic that the game doesn’t feature any actual military conflict in being a wargame, but there is no game out there that better simulates the tone and structure of a conflict as this one has done with the Cold War… which just happens to be one of the most interesting periods in the history of political strategy.